Love the video on You Tube.....speaking of Placido Domingo, I recently auditioned singing a song he did a duet with John Denver - it's called "Perhaps Love". The judge looked at me like the deer in the headlights of a car when I told him what song I would be singing. He said he knew of it; but he was not convincing. I love the comment about the naysayers and the beer in the pub.....I can so relate! Thx Claire for your inspiring comment. I would love to correspond with you personally via email, is that a possibility? Not sure how this works since it's via Barbara's brain child (which I love). Kudos with the upcoming CD - what is your particular genre? Congratulations on following your dream and please do not let anyone derail you. Those who also have a passion for music will understand your motivation but for those who are not so inclined, here's something that has worked for me. I generally point out that many of the breathing exercises we do in vocal work are the same as those used in yoga. Simpy put, singing is good for both physical and mental health. 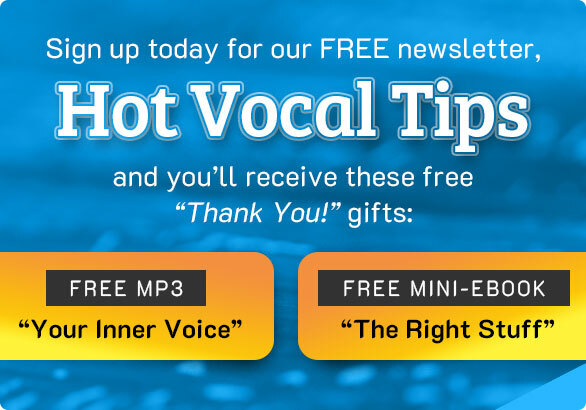 We use so many muscles in our body when we sing and the deep breathing can be very calming. One year ago, I was diagnosed with a rare form of rectal cancer and had to undergo chemotherapy and radiation treatment. I quickly discovered that we even use our rectal muscles in singing. Well, I got through cancer on a song and I am convinced that music has played a significant role in my rehabilitation. I am 59-years-old. I recorded my first CD just before the start of my treatment and I am half- way through recording my second CD to be released September 9th on my 60th birthday! So go for it Christine and just enjoy the ride. I am sorry about your husband and the suffering you have no doubt endured. I wish you clarity, comfort and, in the words of our wonderful mentor Barbara Lewis, I also wish you great singing. Congratulations on going Solo. Yes, one does have to use the voice differently than in choir or ensemble singing. For one thing you do not want to "blend" as in choir, rather you want to stand out, be unique, etc. Use breath, support, focus, open the throat and project the sound. You sometimes have to push, but not force, a bit to build the voice, plus work on flexibility exercises and a variety of music to find your niche and what you can best sing from the heart. Age is not an obstacle, except in the mind. Look at Domingo at 70 for example. Many singers sang long and late into their lives, others stopped sooner, there is no fixed rule - it is per individual. Share it, enjoy it, and let the naysayers go to their own 'pub' to complain in their beer, so to speak. Having music in the house will inspire your husband and help his spirits and recovery. Good luck and thanks for sharing. Enjoy it! What a wonderful post! Great photos, too. I'm so happy that your husband is recovering well. There is nothing like a major health scare to help us rethink our lives. I love that you are venturing out now. Clearly you have a lot to share. You will be the SPOTLIGHT singer in my next newsletter. I know that others will find your story inspiring.